Once known as Royal Chitwan National Park today Chitwan National Park is a protected jungle area filled with wildlife located in the mid-south Terrai area of Nepal. Chitwan used to a hunting ground that royalty used for big game. Established in 1973 conservation orders were put in place to protect the remaining endangered animals found there. In 1984 it became a UNESCO World Heritage site. Chitwan is about 4-6 hours by bus from Kathmandu or Pokhara. The nearest Airport is located in Bharatpur 10 kilometers away. Sauraha is a small town located just outside of Chitwan National Park. Sauraha has a large selection of accommodation, tour agencies and restaurants. 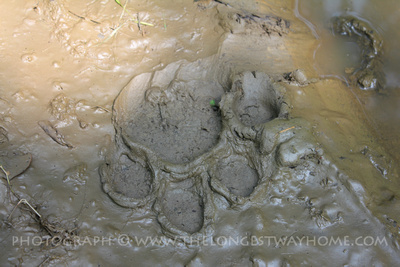 This is most likely your first stop when visiting Chitwan National Park. Here's my complete travel guide in getting to Chitwan National park, including bus times from different cities, transfers and costs: How to get to Chitwan National Park. When is the best time of year to visit Chitwan? 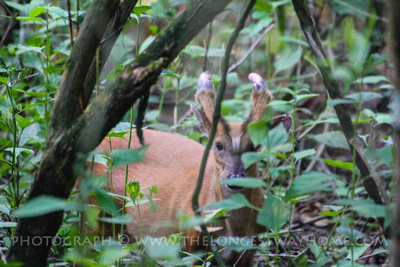 Chitwan National Park is open year round with most wildlife visible. However during the end of the dry season in October to December there is a greater chance of seeing tigers and other wildlife as they come out to the waterholes. Local guides also mention November and December as being good times though it's not that hot. From June - to September it is both Nepals Hot season and Monsoon season. 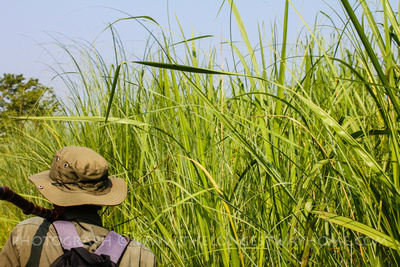 It can get very hot and humid in Chitwan at this time of year making trekking uncomfortable for many. 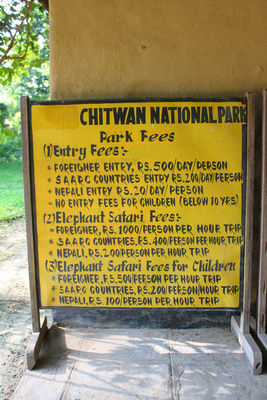 All prices below do not include Chitwan Park's entrance fee (2,000rps per day). The prices below are subject to travel agent fluctuations. Do please see the section further below for full details on Chitwan park fees. 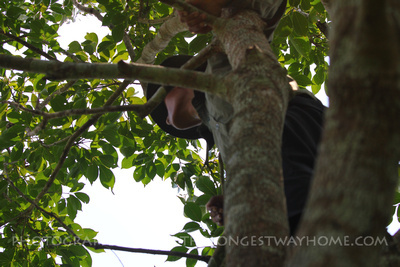 Choose between half day, full day, two/three day, one week or private jungle treks. You can go in a group or alone. Costs may or may not include meals. In many cases a guesthouse will provide a packed lunch/dinner. Prices start from around 1400 rupees for a half day tour to 1800 for a full day jungle trek based on 4 people. Overnight treks usually include accommodation. If traveling alone prices double - but do shop around as you will get cheaper rates. What you can expect to see? depending on the time of year. 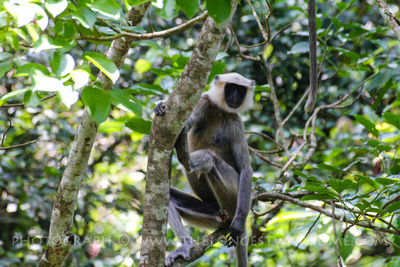 Half day tours usually only end up seeing jungle, Rhesus monkeys and a few birds. If lucky a Rhino. 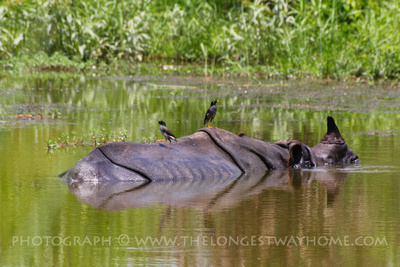 Full day tours will have a greater chance at seeing a Rhino, birds and other wildlife. Overnight tours that go deeper into the jungle have very good chances at seeing Rhino and a fair chance at seeing a tiger. Jeep tours are offered for those wanting to go deep into the jungle quickly. They are often mixed with day excursions and packages. Prices are generally around USD $180 per day inclusive of accommodation and food. 2/3 day package tours are often better value but only if you book in person in Chitwan rather than online where the prices are slightly crazy. 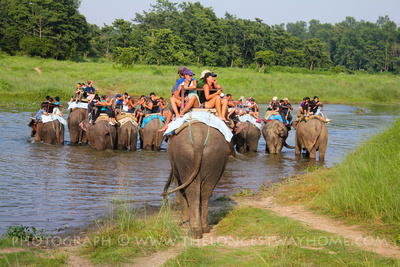 Elephant treks in Chitwan are offered by all lodges and tour agencies. They generally last between 1 and 1.5 hours. Elephant jungle tours usually have three times. Early morning, mid morning and late afternoon. Elephant tours cost between 1800 and 2500+ rupees. These tours are run by people who either own or hire out their elephants. Government Elephant Safari costs: There is a government elephant tour available which costs 2500 rupees however since 2016 it is has become very hard to arrange. This tour takes place in a separate part of the jungle and an additional fees go to fund the upkeep of the National Park and local communities Elephants are also only taken out twice a day. Government elephants are becoming harder to hire out from their official office. It's easier to find them at the NTNC office. Though most are now used for park patrols by rangers. There are separate fees for Nepali, SAARC and foreigners from the Government center. 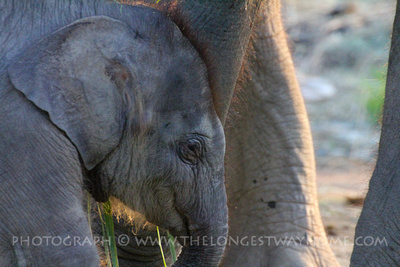 Generally speaking the fee for an elephant jungle trek is: Nepali 200, SAARC 1000, foreigner 2500. Note: The above fees for both regular and government elephant safari's do not include park entrance costs. 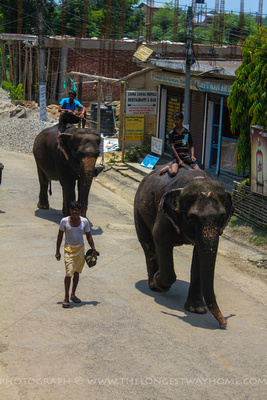 However it's permitted to buy an Chitwan park ticket after 2pm take an afternoon elephant jungle ride and then use the same ticket for a full day trek the next day. What you can expect to see? 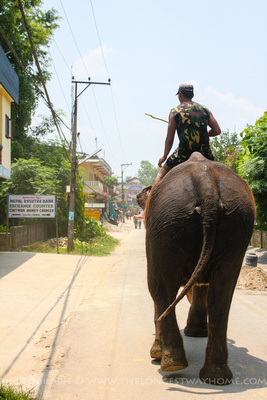 Elephant riding is probably your best way to see Rhinos in Chitwan. Early morning or late afternoon are the ideal times. There are many birds on show along with game. Elephant cruelty? A lot has rightfully been publicized about elephant cruelty thorough Asia. However, do note that Nepal's elephant tourism industry has taken the opposite approach to most of Asia and been used to directly support conservation. 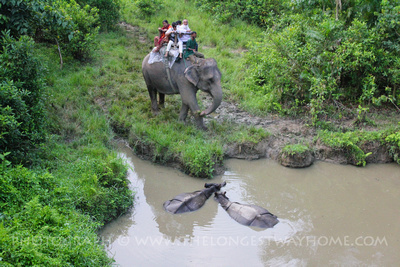 Elephant tourism in Chitwan helps to support jungle patrols to prevent poaching. Nepal has the most successful anti poaching programs in the world and the most successful tiger conservation programs in the world. Do read more about elephant tourism in Nepal before making your own decision. 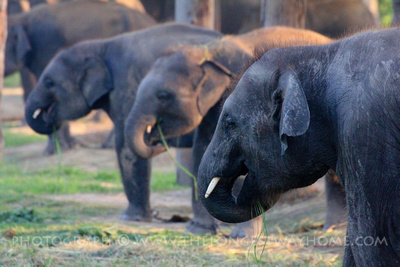 Located in Sauraha the Elephant breeding center was set up to protect the endangered elephants in the region. There are often many baby elephants there and a small museum. The center is walkable from Sauraha but it will take 1 hour depending on the heat and road conditions. Tours or rickshaw transport are available part of the way. Entrance prices are 50/60 rupees for a foreigner (westerner), 25 SAARC, 10 Nepali. Opening hours are 6am to 6pm though generally it starts to close around 5pm. You can buy a ticket to wash an elephant in the Rapti river from many guesthouses or travel agencies. Tickets can be 200 rupees however you are expected to pay the mahout an extra 100 rupees. For a cheaper option head down to the river in the evening where the Mahout (Elephant riders) come to bathe their elephants after a long day's work. They'll often do some showing off and accept tips. Then sit back and enjoy the sunset over the river! Many agencies either rent out canoes or offer half day canoe rides in the Rapti river. Package tours often include 1-2 hours canoeing and then a half day trek back through the jungle as part of the full day jungle trek..
Costs are often the same as trekking tours. 1400 half day to 1800 full day. River dolphins are rarely seen anymore. Local canoes are quite thin and feel unstable, though accidents rarely occur. What you can expect to see? 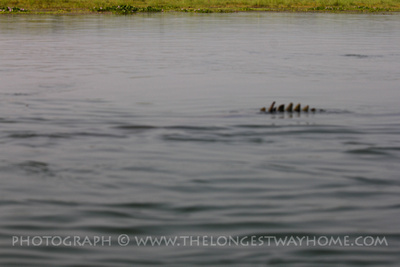 River boating often highlights the many crocodiles that inhabit the river. There are a wide range of birds also found along the river. By far the easiest way to spot the one-horned Indian Rhinoceros in Chitwan is to take an Elephant jungle tour. They last about 1.5 hours. Do not settle for 40 minute tours as some operators cut tours short. The best times to see a rhino is early in the morning or late in the afternoon when they come out to the watering holes. They generally disappear into the jungle during the mid-day heat. Elephants are very quiet unlike trekking by foot so Rhinos are easier to find. Rhinos will only charge people on the ground and not elephants whom they are afraid of. You are safe from Rhino's on top of an Elephant. There's little chance of seeing a Rhino with a half day trek though it does happen. Full day treks increase your chances significantly. As do two day or more tours. Note: though elephant tours are best first thing in the morning and late afternoon it's my experience that the second tour in the morning will get the best results as they will know if the Rhinos were spotting by the first trip or not. Generally Rhinos in this area stick to one or two locations. Spotting Royal Bengal Tigers in Chitwan is not easy. Though their presence is often seen via tracks and waste. Tigers do not like people and try to stay as far away as possible. Generally speaking deep jungle tours are the best chances at spotting a tiger. Though no guarantee is ever made. There's some confusion over ticket prices into Chitwan National Park. I'll try to clear them up but do keep in mind it's Nepal and prices often change. Sauraha is a town outside of the park. There has never been a fee to enter the village. Sauraha is where the majority of people stay when visiting Chitwan National park. The current cost of a Chitwan National Park permit is 2000 rupees for a foreigner. 1000 rupees for SAARC. 50 rupees for Nepali. The prices increased in mid 2018 and are reflected here. The ticket is valid for one day only. However, if you buy your ticket after 2pm with proof or a next day half/full day jungle trekking ticket you can take a late afternoon Elephant jungle tour on the day you buy your ticket. People staying within the park on package tours will often have the ticket prices included in their tour packages. Official tickets are available at the National Park ticket office which is on the Sauraha side of the park just along side the river. If walking there be prepared to be asked questions and offered many treks by guides and touts. Generally speaking it's easier to have your guesthouse or tour guide to purchase the ticket for you. Though there is a small and interesting museum beside the ticket office. Should you stay inside Chitwan Park or outside Chitwan Park? Understand that lodges are banned from operating inside the park so don't believe anyone who tells you that their accommodation is inside the park. Staying outside Chitwan National park means you will be staying in Sauraha town which has a wide selection of guesthouses that vary in price from $5 per night upward to $150+. Most travelers stay in accommodation within Sauraha and arrange jungle treks or excursions from there. Do check out my personal reviews on accommodation in Chitwan. Or use my search below. It will search all the major booking sites, is free to use and will find you the best prices! Common sense is important considering Chitwan National Park is a tropical jungle with active wildlife. Tigers, elephants, crocodiles, snakes and rhinos top the list of dangerous animals in Chitwan. But it's the Sloth Bear that's attacked more tourists than any other animal. It's aggressive and does not retreat. The only defensive against a Sloth bear attack is to stay in a close group and stand tall. Better yet, avoid them at all cost. Good trekking guides will advise you on what to do in the event of an encounter with a wild tiger, crocodile, elephant, snake, rhino and sloth bear. Take note, seriously. Avoid trekking alone in the jungle at all costs. Avoid bathing in the rivers. Stay quite in the jungle when on an elephant and do not shout. I've heard many a guide complain that bringing very small, and / or loud children into the jungle or on elephant treks is not a good idea. I would agree. Mosquito's are ever present in Chitwan and Sauraha. Outbreaks of Dengue do happen and Malaria though not prevalent does exist. Take precautions not to be bitten and try to ensure your bed has a mosquito net. What's cheaper arranging everything independently or taking tours to Chitwan? It's cheaper and easier to take guesthouse tours or tour agency packages once you arrive in Sauraha. Chitwan National Park now ensures that all guides be accredited. That said, there are still some "independent" guides lurking around. I've spoken with several "independent guides" and though what they offer seems good they'll often cite the money is for their family or the trekking agencies rip them off. It's hard to tell who is telling the truth. But going with them without tickets etc may end up with you getting into trouble as they may not be qualified, may take you to dangerous areas and may end up with park rangers arresting them. 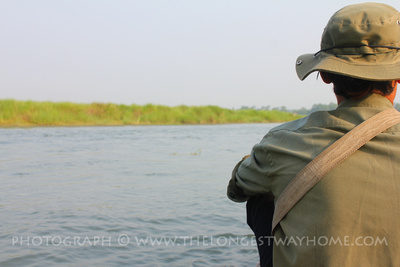 Keep in mind poaching is a real threat to Chitwan and park rangers are there to ensure laws are upheld. Is it cheaper to get a package tour to Chitwan from Kathmandu/Pokhara/Online or get one once I arrive? It's cheaper to just arrive in Sauraha in the morning, spend some time locating a nice guesthouse based on their room and tour prices and go with them. It's also possible to stay in one guesthouse and take tours with another or an agency in Sauraha. It might annoy the guesthouse owners a little though. But there's nothing saying you cannot do this. A prime example is the half day river tour. Essentially you are put on a canoe, paddled down the river and then left off at the side of the road to walk back. There are jeeps around and the odd bus but they'll charge you 100-200 rupees. A better option would be to take the full day jungle tour which includes an hour on the river. Or, to rent a canoe for the day. You could arrange this by just going down to the river and speaking with one of the boat men and haggling them to a good price. Take advantage of the unwritten rule that your full day Chitwan ticket can be used to take a late afternoon Elephant tour on the day you buy the ticket. There's also another (slightly harder option) of going on a full day jungle trek and then using the same ticket to go on a next day first morning Elephant tour. Best to speak to the same tour operator or guest house owner you bought your tour from for this so they can have a "word" with the Elephant safari people. 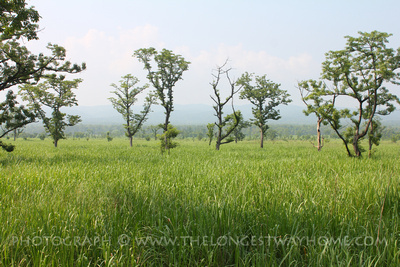 Are you looking to discover more about Chitwan National Park? 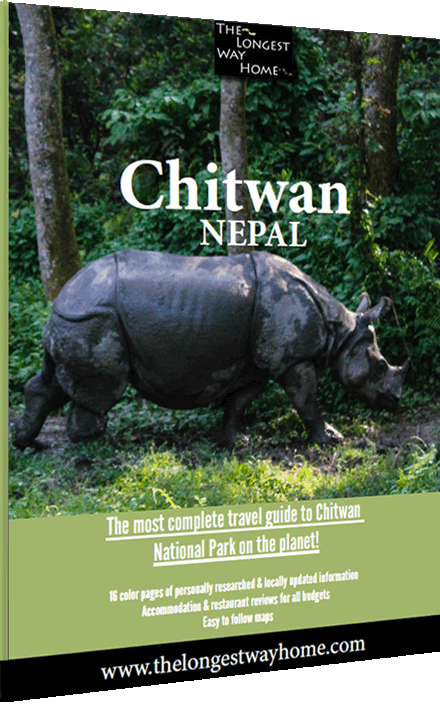 Look no further as I've written the most comprehensive travel guide to Chitwan!